Ballistic plates are available for the target system. The standard plates are made from A-36 plate steel. Our Ballistic plates are cut from a full 3/8" thick AR-500 abrasion resisting steel. The AR-500 plate has a Brinell hardness of about 500. Most plates on the market are manufactured from what is called T1 Steel. T1 steel has a Brinell hardness around 280. 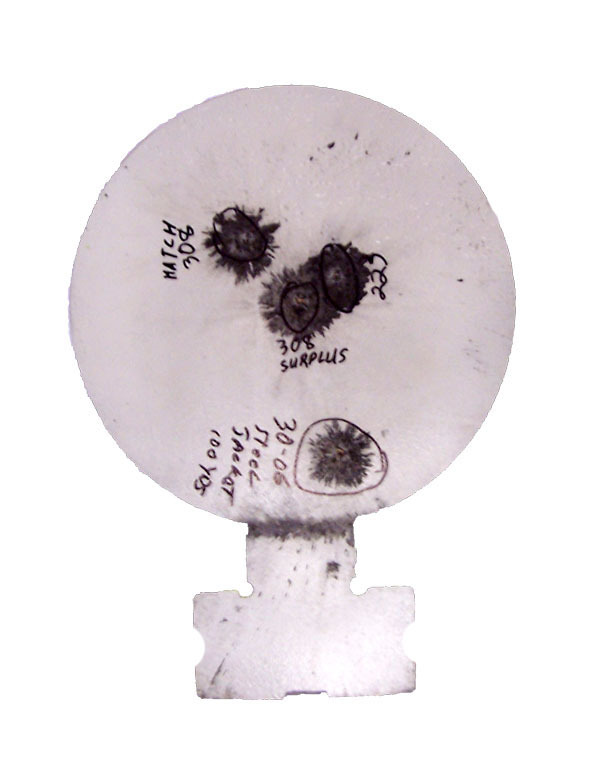 Below is a picture of a 6" plate made with ballistic steel. As you can see it has been shot with a .233 Rem, a .308 match, a .308 Military surplus, 30-06 Lake City Steel Jacket military surplus round. All were fired at the target mounted on a our target stand at a distance of 100 yards. As you can see there is no hole and no crater on the front side. Ballistic plates are easily identified from our A-36 plates by the notch cut on both sides of the mounting tab. Note: The appearance of rough edges on the plate in the picture are due to the removing of the background from the picture and not from the manufacturing process of the plate.